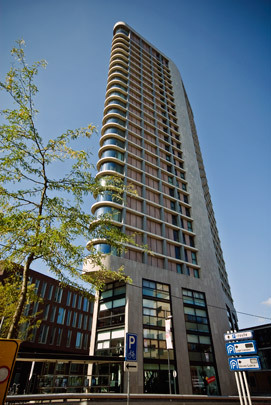 This residential tower is part of Coenen's own masterplan for the area centring on Smalle Haven. Its floor plans have a slim line lozenge shape whose tapering rounded extremities make the tower look even slimmer than it is (14 metres at its widest). Facades are a combination of lightly projecting floor slabs and round columns with full-height glazing in-between. The grid pattern is interrupted at the kink on the long sides by imperforate areas of cut stone with the stairs, lifts and bathrooms behind them. The first four storeys contain offices and the next 24 each have two apartments of 130 square metres apiece on either side of the central core. A pair of two-storey luxury penthouses terminate the tower.